Do I really need to replace my roof? Our contractors can perform a thorough roof assessment so that you’ll know where you stand. We have over 50 years of experience helping our clients with their commercial roof replacements. Your situation ultimately comes down to "when," not "if." Commercial re-roofing service can be costly, but water damage to your building and expensive mold remediation can be much more expensive. As a building manager, your duty is also to protect the health and property of those leasing space from you. If your roof is over 20 years old, it may need commercial re-roofing. A simple repair may not be enough for the job when a roof has many missing, cracked, or curled shingles. Dark spots on your roof are also signs that it could need a replacement. These are missing granules, which protect your roofing system from fire and heat. Roofs that have surpassed minor leaking and the need for major repairs should be replaced promptly by a trained roofing contractor. The Original Roofing Company works with several commercial roofing systems. 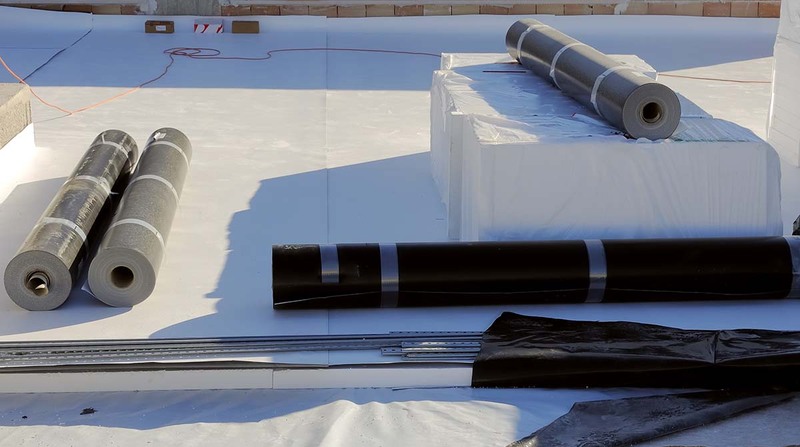 Designed to be installed in a single layer, single-ply roofing membranes have great flexibility and are highly resistant to UV rays. They come in a variety of materials and can be installed using a ballasted, mechanically attached, or fully adhered method. Single-ply roofing materials are not only easy to install but also have a competitive cost. One of the most popular choices for commercial and industrial buildings, asphalt roofing materials are extremely durable and long-lasting. Built-Up roofing (BUR) and modified-bitumen (MB) asphalt systems are made up of multiple layers to protect properties against changing environmental conditions. Metal roofing systems are appealing because they can be made to look like common roofing materials like asphalt, cedar shake, slate, or clay tile. We work with top industry manufacturers, such as Drexel and Berridge, to provide metal roofs that are stronger and more durable than many other materials on the market. From small commercial properties to large industrial buildings, our contractors are pros at handling any steep slope roof application. We’ve installed thousands of roofing systems on steep slope roofs over our many years in the business. The cost of a new roof will vary depending on the size of your property, the material you choose, and the severity of the project. Our team can provide you with a free estimate and help you determine a budget for the replacement. As a preferred roofing contractor serving the Las Vegas area, we’re committed to helping our customers find cost-effective solutions for their roofing issues. We understand that this is a big investment, and we don't take that lightly. We'll give you an honest assessment about the state of your building or facility's roof. That means if it can be repaired, we'll repair it. If we have recommendations that can help you save money in the short term, we'll tell you. The Original Roofing Company has performed millions of square feet of roof work over the last 50 years. We’re also proud to have earned a spot among the Top 100 roofing contractors in the nation 5 years running. Our professional crews are trained on a variety of different roofing systems, so you can feel confident that you’ll get quality work according to manufacturer specifications when you rely on us for your commercial re-roofing project.